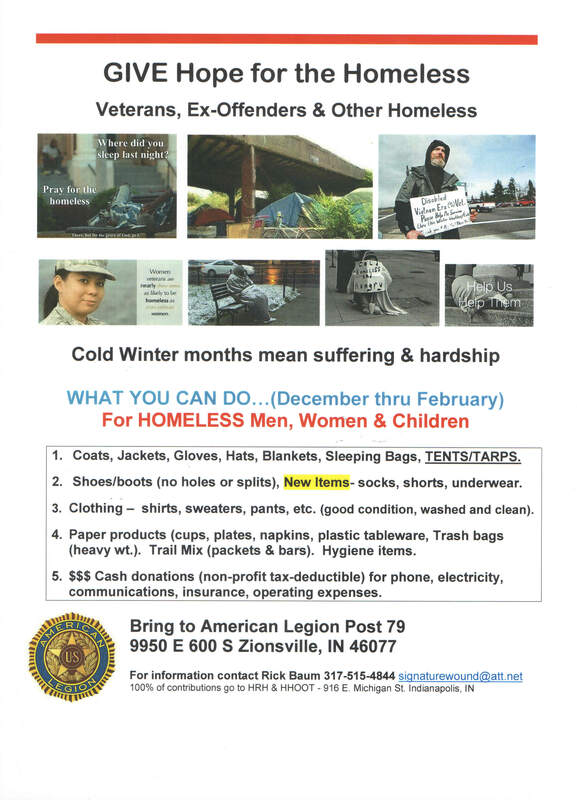 The Zionsville American Legion is a collection center for ‘Hope for the Homeless’. Coats, Jackets, Gloves, Hats, Blankets, Sleeping Bags, Tarps & Tents. Shoes & Boots (without holes or splits), New Items: Socks, Shorts, Underwear. Clothing – Shirts, Sweaters, Pants, Etc. (Good Condition, Washed, & Cleaned). Paper Products (Cups, Plates, Napkins, Plastic Tableware, Trash Bags (Heavy Weight). Hygiene Items (Soap, Shampoo, Toothbrush, Toothpaste, Etc). Ready to Eat Non-Perishable Food Items, such as Trail Mix, Granola Bars, Energy Bars, Etc. Cash Donations (Non-Profit Tax Deductible) for Phone, Electric, Communications, Insurance, Operating Expenses.